Lucy here! One day when I was going through blogs I ran across a blog entitled Rediscovered Families with a post about a child with a mathematical learning disability. It interested me and now Sharon is sharing her story to bring awareness to this mathematical learning disability called dyscalculia. Sharon: For a long time my son struggled with math. No matter how hard he tried he couldn't master it. Numbers were like moonbeams that slipped through his fingers. He could see they were there, but couldn’t grasp them. He was gifted in language and it was obvious that he was intelligent, but even the most basic math was a nightmare. 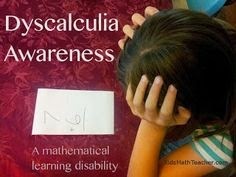 He struggled with math for 9 years, then one day I heard about something called “dyscalculia.” Dyscalculia is a mathematical learning disability that makes it really difficult to recognize, understand, and organize mathematical information or symbols. The name comes from Greek and Latin, which means, “counting badly.” People with this disability have significant problems with numbers, despite having a normal or above normal intelligence. You can find a comprehensive list of symptoms here. My son had almost every one of them. Suddenly a light bulb went on in my head. Was it possible that my son had a learning disability? I approached the school with all the information I had gathered and asked for him to be tested. Less than one month later an educational psychologist diagnosed my son with dyscalculia. Oh how I wish he had been diagnosed earlier. There are so many strategies that can be put into place to help children with this learning disability. They would have saved us hours of frustration. The most shocking thing for me was to realize how profoundly his struggles had affected my son’s self esteem. He confided in me that he thought he was stupid. My bright, intelligent, gifted son had labeled himself as stupid. I was heartbroken. My son’s story is not unusual. Every one of his teachers talked about his difficulties in math, but none of them had heard of the disability, so they didn’t make the connection. It is estimated that 4-6% of the population have this learning disability and yet very few are diagnosed. Thousands of learners go through school without being diagnosed. Many of them will also come to the conclusion that they are stupid. My son is now a young adult making his way in the world. We had four years to help him develop strategies for dealing with his disability. He managed to pass his required math exams and was able to graduate from high school with no problems. This disability has caused some hard struggles at time, but it hasn’t held him back one bit. The Dyscalculia Forum has a wealth of information. The National Center For Learning Disabilities has some helpful information pages and a useful table that lists the symptoms by age. Earlier this year Discover Magazine printed an interesting article How Can a Smart Kid Be So Bad at Math that gives an overview of dyscalculia and describes some of the research that has been done recently. Lucy: Thanks Sharon! I do have a few questions. Your story made me curious and I wonder about a few things. Sharon: I'd be happy to answer your questions. Lucy: What teaching strategies were implemented to help your son? Making sure he used graph paper to help him keep the numbers in line. Being given permission to read math problems out loud as this seems to help those with dyscalulia. This was a problem during exams, but if he need to do this he was permitted to leave the room with a teacher's aid. When presenting new material teachers were asked to make sure he was able to write each step down and talk it through until he understand it well enough to teach it back. For the first year after his diagnosis my son had a teacher's aid assigned to him for math. His mark went up from 48% to 80%. Unfortunately the province cut funding for that kind of help and his mark plummeted, but at least we knew why. Lucy: Was there any special paperwork required with the school (like an IEP or 504)? Sharon: We live in Alberta, Canada, so we have different paperwork. Every year the head of the special needs program meets with teachers, student, and parents to write up an IPP (Individual Program Planning) for the student. It outlines the special need and details what accommodations should to be made. In theory every teacher is supposed to read this document. I quickly found out that very few teachers actually read it, so every year I made a point of talking to every staff member who taught him. This learning disability has an impact on almost every subject, even arts. For example my son needed to have all instructions written down as he can't hold verbal instructions in his head. As he grew he learned how to write those instructions down himself, but at first teachers needed to check that he was doing it. Lucy: What seemed to help him learn math (visually seeing 6 and a picture of six things)? Sharon: I can't say my son ever learned math, but having the use of the calculator really, really helped. I understand that if he had been diagnosed earlier there is a lot that can be done to help the student visualize numbers, but that didn't happen for my son. Children with this disability need a lot of help and patience. They will find it almost impossible to learn their tables, or grasp number facts. They can learn how to do math, but it will take a lot of extra time and effort. They tend to respond well to individual tutoring as long as the tutor has some understanding of the disability. Lucy: How severe was your son's case? Can you share some specific examples with us? Sharon: I don't really know how severe my son's disability is as I have nothing to compare it with. I can tell you that he was never able to learn his tables, or do mental arithmetic. In grade 7 he would still need to use his fingers to do simple math like 7+2. At age 9 he was not able to figure out that 5+4 =9 therefore 9-5 = 4. He simply wouldn't be able to see the pattern. He is now an adult, but still has a hard time calculating how much change he should get. He has a terrible sense of direction (another classic symptom), and in an unfamiliar setting almost always heads off in the wrong direction. Curiously it is not uncommon for children with this disability to have above average language skills. When he was diagnosed the psychologist noted that he scored higher than 90% of his peers in vocabulary and reading comprehension. Lucy: Thank you so much for your time Sharon! It has been a pleasure learning about your experience and about this disability. I was not aware of dyscalculia before reading your blog. You can read more from Sharon at her blog Rediscovered Families: http://rediscoveredfamilies.com where she writes about having fun and creating deep connections with your children. Lucy, thank YOU for posting this interview. It's very helpful...brings light to the subject that a lot of kids struggle with. Thank you! !